There are many reasons skin rashes occur, from insect bites to serious medical conditions. If you experience a rash, it's important to identify its cause so you can seek appropriate treatment. The condition usually affects the scalp, the T-zone on the face and, sometimes, the genitalia. Atopic dermatitis, a type of eczema, is genetic and causes long-term irritation that flares up occasionally. It mainly affects the face, as well as the neck, elbows, wrists and knees. Heat rash often appears during bouts of hot, humid weather that leads to sweating. The rash can appear anywhere on the body, but especially on areas where the skin folds, such as the neck, belly, groin, buttocks and under the breasts. Pityriasis rosea is a skin rash that can affect people in any age group but tends to occur in people between the ages of 10 and 35. This rash typically goes away by itself within six weeks. The cause of lichen planus is unknown, but is often attributed to an allergic reaction. This common rash appears in the form of single or clustered skin lesions. Over the counter antihistamines and topical ointments may help mild cases, though more severe rashes may require corticosteroids or ultraviolet light therapy. A biopsy may be required to confirm diagnosis. The rash usually appears on the back, abdomen or face, and it can spread over the entire body. Outbreaks usually last two to four days, and then healing begins. Once a person has had chickenpox, he or she is susceptible to an outbreak of shingles later in life. Shingles are caused by the same virus (varicella-zoster virus) that causes chickenpox. Once a person has had chickenpox, the virus remains dormant in her system. For reasons that aren't completely understood, the virus can reactivate and cause a painful condition known as shingles. Measles is a childhood infection that was once very common but can be prevented due to vaccinations. A measles infection often causes a rash seven to 14 days after exposure to the virus. Scarlet fever is an infection caused by bacteria that produces a sunburn-like rash in the face and possibly other areas of the body. This is usually treated with antibiotics. A staph infection is caused by Staphylococcus bacteria. This type of bacteria is often carried on the skin but when there is an injury, the bacteria can enter the system and cause an infection. Different staph skin infections include boils, impetigo, scalded skin syndrome, and cellulitis. This is a picture of a staph infection in a surgical wound. Impetigo is a very contagious skin infection that is more common in infants and children. It usually occurs on exposed parts of the body like the face or the arms and legs. The mites that cause scabies typically inhabit skin crevices. Hand-foot-mouth disease is a common viral infection in children. It is most commonly caused by coxsackievirus. Lyme disease is caused by the bacterium Borrelia burgdorferi which is passed onto humans by tick bites. Fifth disease is a viral infection caused by human parvovirus B19. It typically occurs in pre-school and school-age children during the spring. Ringworm can appear on the skin, scalp and nails. Home remedies can provide relief from the symptoms of ringworm. The rash can last from one to three weeks if left untreated. However, your doctor can recommend products to help the rash heal more quickly. The rash usually runs its course in about 24 hours. It can be caused by a variety of factors, including stress. Cercaria dermatitis or swimmer's itch is an allergic reaction to certain parasites found in fresh or salt water. This condition usually resolves on its own in a few days. Intertrigo is a skin inflammation that occurs in moist, warm areas of the body such as skin folds. It can be aggravated by moisture, bacteria, yeast, or fungi in the top layers of the skin. It can be a common complication in diabetes or obesity; it can also appear as diaper rash in infants. 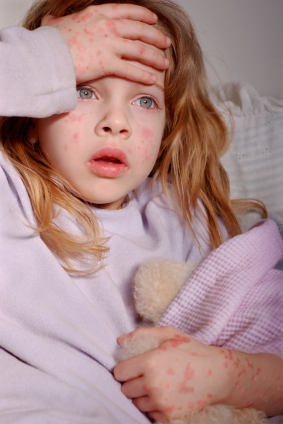 Allergic reactions to medications and other substances may cause a widespread rash over the body. Discontinue medications if they cause a rash and discuss with your physician. Insect bites can often cause itchy or painful rashes. Here a wasp sting has caused a red rash. Although many insect bite rashes can be treated at home with cool compresses or over-the-counter antihistamine creams, rashes that are severe or that get worse instead of better should be evaluated by a doctor for possible allergies. Insect bites can be fatal in allergic persons. The majority of spiders in the US are not dangerous to humans - even if you get bitten. For most spider bites, you may have a reaction similar to a bee sting with redness, pain, and swelling at the site. However, there are a few particularly dangerous spider bites, specifically bites from brown recluse and black widow spiders. Seek medical attention right away if you suspect you have been bitten by this kind of spider. Bites by a black widow spider can be quite dangerous. Immediately seek medical attention if you suspect you have been bitten by this kind of spider. You should always consult a physician for a proper diagnosis of any skin rash, but looking at images of various rashes may give you some idea of what you might be dealing with.